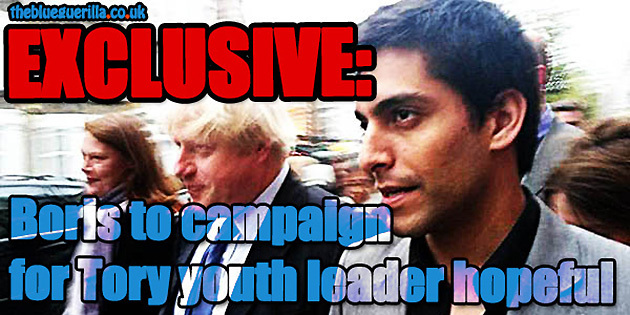 TheBlueGuerilla: EXCLUSIVE: Boris Set To Campaign For Tory Youth Leader Hopeful. EXCLUSIVE: Boris Set To Campaign For Tory Youth Leader Hopeful. MAYOR OF LONDON Boris Johnson has apparently pencilled in a campaign day attendance into his diary for Prospective Tory Youth Chairman, Mahyar Tousi, during his 2014 local election campaign to become Councillor in the London ward of Lee Green. Tousi was selected for his local London ward last night. Boris and Tousi have recently been snapped on multiple occasions together in London. Sources speculate that Boris will attend a campaign day and visit local businesses in the area, tbg can reveal. One CF'er said Tousi was now "very close" to the golden endorsement for Conservative Future Leader from the most popular Tory in the country, Boris Johnson. You should probably ask City Hall for a comment to see whether these rumours are true. Endorsement from Boris? That's nothing. SJS has Robert Winfield. Didn't realise TBG was an outlet of Comedy Central. Good luck but still no mention of free KFC for his campaign!! The only tools I endorse are Black and Decker. "The hard work starts tomorrow.."
Lol. As if Mahyar knows what hard work is. When was it Mahyar left the English Democrats?